With the introduction of new fuel types in today’s changing landscape, compatibility in alternate fuels and protection against accelerated corrosion and extreme environments is a must. Red Jacket’s unsurpassed expertise helps sites optimize fuel ﬂow. 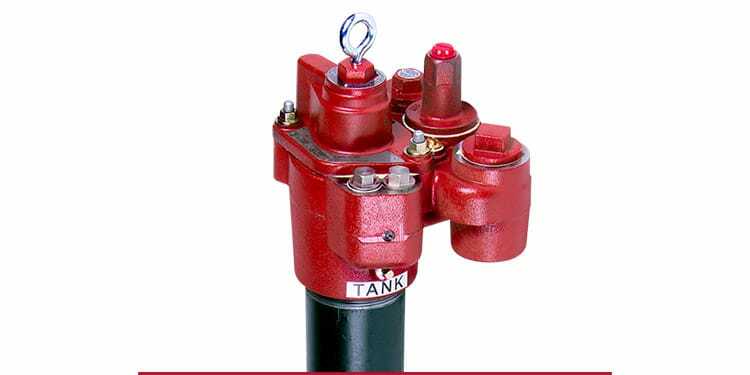 Part of the industry’s leading Veeder-Root suite of products, Red Jacket’s family of Submersible Turbine Pumps (STPs) and Pump Controllers ensures that sites can pump fuel quickly, efﬁciently and safely – whether it’s motor fuel, diesel, aviation gasoline, LPG, ethanol/methanol or kerosene – in aboveground or underground storage tanks. As a Veeder-Root ﬂagship product line, Red Jacket is backed by the largest network of distributors and authorized service contractors worldwide. Why choose Fixed Speed over Variable Speed? Red Jacket fixed speed technology is less expensive than variable speed to buy, own and operate. It delivers faster, more reliable fuel flow for the lowest cost of ownership. While you may have heard that variable speed will help you meet flow rate required with faster fill times during peak hours and provide power savings during non-peak hours, fixed speed equipment uses less power during operation and when idle. Concerned with minimizing hydraulic hammer, a sudden spike in pressure resulting from a stop in flow within a pressurized piping system? 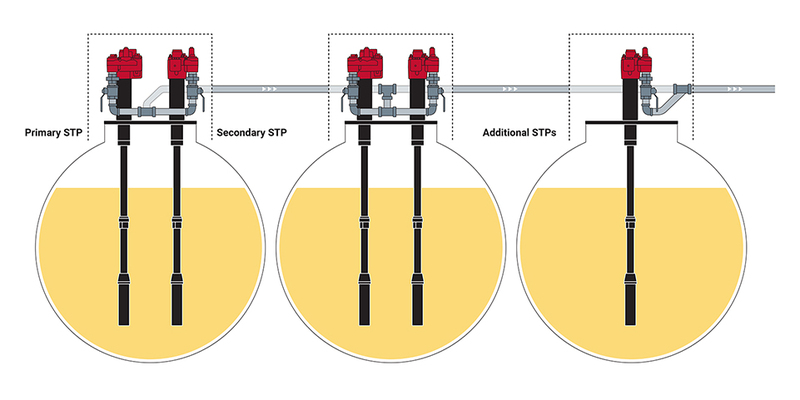 Modern dispensers come with flow control features which makes it unnecessary to limit or 'dial-back' the STP. And, while pumping pressure with variable speed may be less, maximum pressure with fixed speed never can be higher than the design pressure, as modern dispensers limit flow within set parameters. 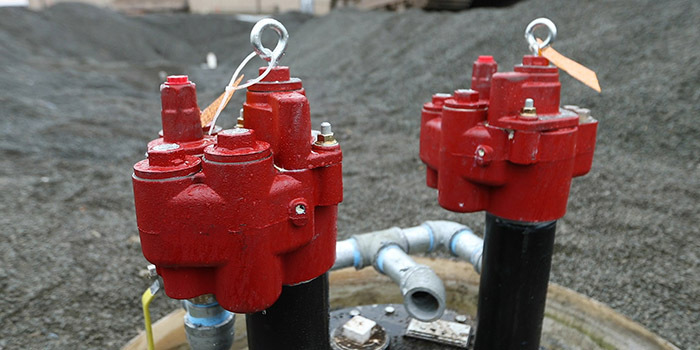 Two fixed-speed 2HP The Red Jacket Pumps manifolded together provide profit-saving protection against outage and better flow than a single 4HP pump (Sump must be 42" in diameter or greater). 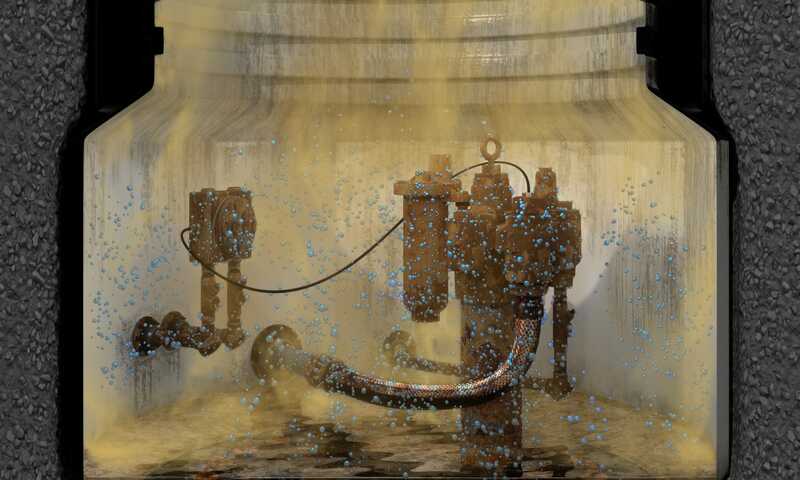 When using a single 4HP pump, a pump or controller failure brings down a fueling site. The 2+2 Solution provides seamless redundancy and optimal flow for your site. The 2+2 solution provides redundancy and backup operation with automatic failover. Switch-on-the-fly will switch STPs in live mode, without waiting for an on-hook condition, essential for maintaining balance at busy sites. 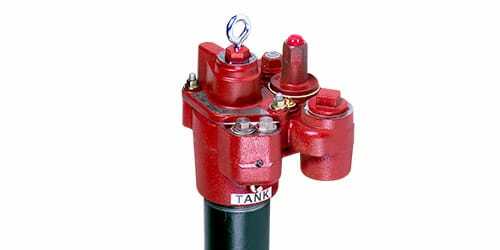 Integrates control with Mechanical Leak Detection (MLD) or Pressurized Line Leak Detection (PLLD). Red Jacket offers STPs in three levels of protection, along with a number of supporting products, to limit the effects of corrosion. Your level of protection depends on fuel types and your sump environment. 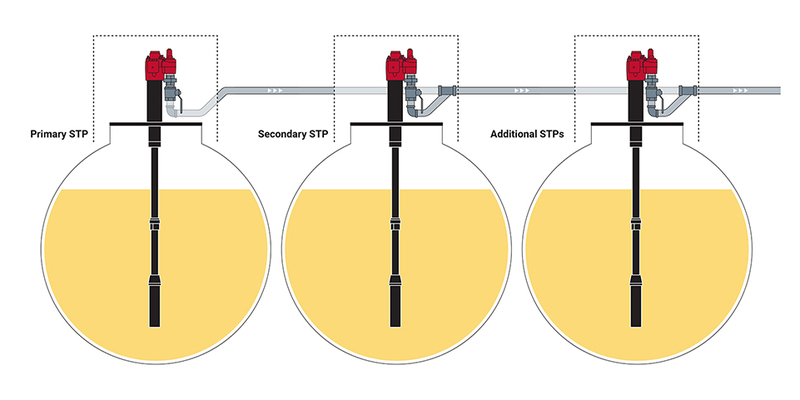 The Red Jacket® STP solution optimizes fuel flow and dispensing. It is the foundation model that sets the standard for high throughput, high reliability fueling applications. The Red Jacket’s motor performance delivers higher flow rates than comparable submersible fuel motors. 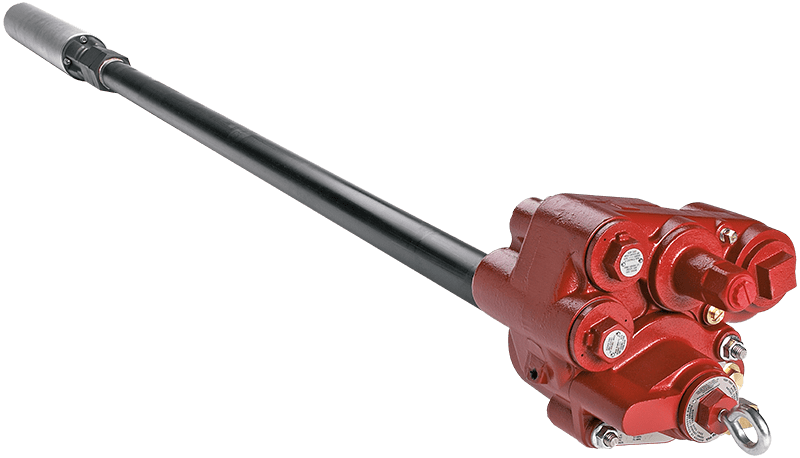 The STP also features Red Jacket’s advanced packer manifold design, making it the industry’s easiest and safest STP to install and service. 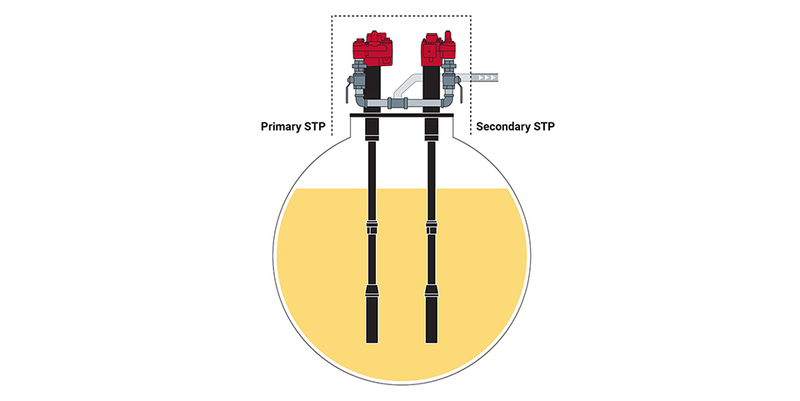 This STP solution is available in ¾HP to 2HP motor configurations and fixed or Quick Set® adjustable lengths. The Red Jacket® Alcohol Gas (AG) STP has as additional 30% increase in stainless steel hardware from The Red Jacket STP. 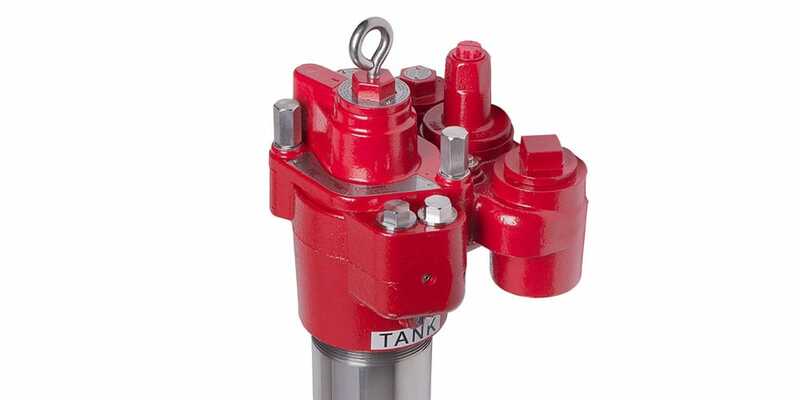 It has all the advantages of the Red Jacket® Submersible Turbine Pump design, but was constructed with stainless steel on all parts exposed to the fuel path. The Red Jacket Alcohol Gas STP is built to handle 100% Ethanol and Methanol, and certified for renewable fuel biofuels. The Red Armor® STP has an additional 30% increase in stainless steel hardware from The Red Jacket AG STP. 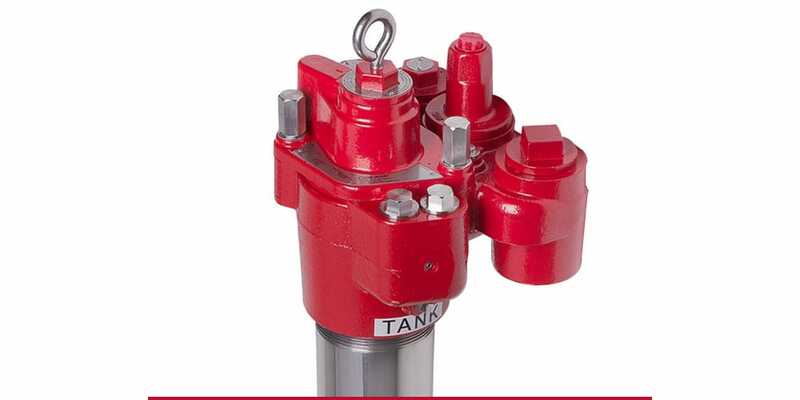 It has all the advantages of the Red Jacket® Submersible Turbine Pump design but was constructed specifically to withstand corrosive environments. Whether your site is struggling with Ethanol-induced in-sump corrosion or ULSD-induced in-tank corrosion, with its specialty coating and stainless-steel construction, the Red Armor® solution is designed to survive. Need help diagnosing the risk of corrosion in your sump environment?